Getting your show pig off to a good start is one of the most important aspects for feeders to consider. We call this phase of the project the “receiving” phase. This is one of the most stressful times in a show pig’s life and steps need to be taken to ensure that this transition from the breeder’s farm to your barn is as easy as possible for your pig(s). Laying the proper foundation from a nutritional standpoint is a key step when receiving baby pigs. Studies have shown it is advantageous to incorporate Amaferm® into a show pig’s diet at this stage. Amaferm is a natural feed additive that acts as a prebiotic and increases feed digestibility. Amaferm works best when fed to animals during high stress periods in their life, making the receiving stage a perfect time to begin to introduce it. There are two options for incorporating Amaferm into your pig’s diet; through Vita Charge® and Sure Champ® Spark. Using Vita Charge at this stage is the quickest and most effective way to boost appetite by keeping their energy high and digestive system functioning correctly. Use Vita Charge Liquid Boost® or Paste to get an initial stimulant response for the first 3-5 days after bringing your pig home. For Liquid Boost you can utilize a water medicator or top dress it on their feed or in their water cups as directed on the label. If Vita Charge Paste is a better fit for you, the paste can be placed in their mouth or on top of their feed. When possible, it is also helpful to give Vita Charge Paste while loading pigs from the farm to help them battle the stress of the haul to your facility. 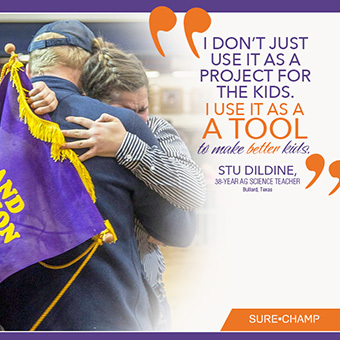 Utilize Sure Champ Spark, after the first 3-5 days of Vita Charge, throughout the feeding period until show day as a daily maintenance product to keep Amaferm in their diet. 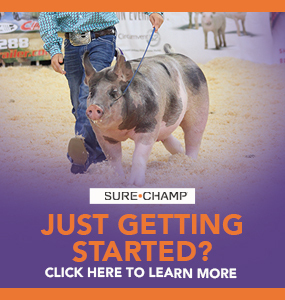 Keeping Amaferm in their diet daily, through the use of Sure Champ Spark, will help you to continue to maximize appetite and digestive health in your show pig, and increase their ability to maintain consistent and high consumption throughout the entire feeding period. 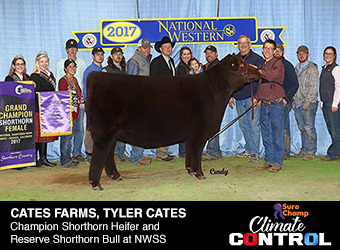 Next, the feed ration that you choose should be somewhat similar to the breeder’s to make the transition to your show barn less stressful. Ask the breeder what feed the pig was on from a protein, fat, lysine, and medication standpoint and keep your pig on a feed that is similar. For more information on feeding your pig, check out our “How Much Should I Feed My Pig” blog post.